I have an iMac mid 2011 at home. When I was not home, I may need to access my mac with Screen Sharing. However the iMac display will turn itself on when I connect via Screen Sharing. The problem is I don't want to scare my family at home (with the elders and kids) as the iMac "turn itself on suddenly". This is a problem specific for iMac. On MacBooks (Pro, Air, whatever) I can set the brightness to the lowest setting so the screen is black (i.e. the LED light is off). However on an iMac you cannot turn off the LED backlit by setting brightness. The display is still bright and everything is clearly visible even on lowest brightness setting. Therefore these solution are not working as the display will turn on as soon as you move your mouse or hit any key on the keyboard via Screen Sharing. Question: Is the a way to keep the iMac display off entirely while you accessing it with Screen Sharing? OS X Lion added per-user screen sharing: the ability to have multiple remote desktop sessions active on a single Mac at the same time. It's not a perfect solution, but you may find it good enough for your case. When you connect to your Mac via Screen Sharing make sure the session is in Control Mode, not View Mode. You can switch modes by pressing Cmd+Option+X in the Screen Sharing app. Once in Control Mode, look under the View menu and you should see an entry that says "Switch to Virtual Display". Select that to change the session to a virtual display, not the current desktop display, and log in as yourself. The main display on your iMac should go to sleep according to your screen saver and energy settings once you've disconnected your remote session from the physical display and moved it to a virtual display. The only flaw in this approach is I know of no way to start Screen Sharing on a virtual display from the get go. So the initial connect always wakes up the physical display. 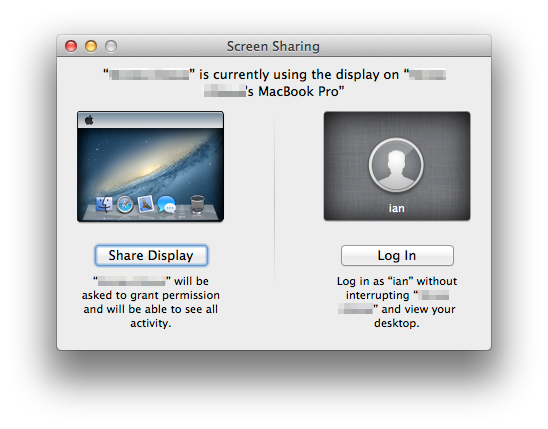 If someone else is already connected to the Mac as a remote user, a dialog asks if you want to share the display with the other remote user (Share Display), or log in concurrently using a different user name and screen (Log In). Choose the option you want. If you choose Log In, you will share the Mac with the other remote user, but you won’t share the same screen. Here's a dirty way to do this (since the Virtual Desktop option is only available when there's more than 1 person logged in): On the Mac you want to access, create a Guest User account, and log on this account. When you screen share to this Mac, it'll ask you if you want to share the display or connect to a virtual display. Choose the latter. The Guest User account will be the one that's displayed on the Mac screen. This is not a perfect solution but I believe this is a best solution so far. My use case is to use iMac remotely from my Windows 7 laptop. You need the following things. Vine VNC Server from http://www.testplant.com/products/vine/vine-server/. You need another VNC server to make another private display. Wake Up Me On utility from http://www.nirsoft.net/utils/wake_on_lan.html. This is a windows utility but I think there is a similar one for OS X. Turn on “Wake for network access” on Energy Saver of System Preferences and set Computer sleep to Never. if this is not never, iMac goes to sleep shortly after VNC connecting. You may need to activate Fast User Switching. Select 1 from Display Number and enter 5901 to the port. Do not use 0 as the display number. Display 0 means the main console. i.e. the monitor. Launch VNC client. I am using Real VNC viewer but it does not matter. Check if everything is working well and then close the VPN client. Sleep iMac by clicking Sleep on the bottom <- this is very important. Just turning off the monitor using Ctrl-Shift-Eject does not work. Wake up the iMac using the Wake Up Me On utility. Now you can use iMac and the monitor is still off. The key to this solution is to sleep iMac when you leave and wake it up through network access (iMac works as normal after waking up but the monitor is still off) so this may not work outside of a local network. (I have confirmed this works on a iMac 27-inch Late 2012 with Mountain Lion). Jolly's Fast VNC client has an option under the Advanced preferences called "Enable Remote Screenlock" that sounds exactly like what you're describing. Another possible solution is a password-protected screensaver with a short timeout. That way if you leave your station logged-in and unattended, it will lock itself down. I have found a workaround, but that's not perfect. With Brightness Control (freeware), I can make my screen black while everything is still visible via Screen Sharing. However it didn't turn off the LED light. A black screen with the LED backlit on is still drawing enough attention in the evening. Unfortunately the Brightness Control app no longer work on Mac OS X 10.11 El Capitan. Instead of turning the computer off, or putting it in sleep mode, you could consider just turning the display off. There is a key combination that you can use to turn the screen off which is: ctrl + shift + eject. Not the answer you're looking for? Browse other questions tagged mountain-lion display screen screen-sharing . Turn off desktop screen/keyboard when connecting via VNC? Can you turn off or disable the display on an iMac? What is the reason for the large minimum brightness of MacBook Air (or other devices)?